Pancakes were always a Sunday morning ritual in my house growing up. My mother used to make a massive stack of delicious, fluffy pancakes and I would lather mine with copious amounts of nutella. I’m so grateful that as a vegan I haven’t had to fully give up this Sunday indulgence. I’ve modified a basic pancake batter to create this simple, fuss-free recipe that is so easy to make. The best part is that most of the ingredients are usually already stocked in your kitchen cupboards and it’s extremely versatile so you can change it to suit whatever toppings you have on hand. I’ll definitely be posting more variations of these pancakes so stay tuned and subscribe to the blog! In a mixing bowl combine the flour, baking powder, and salt. It is best to seive the flour to avoid any lumps. Fold in the non-dairy milk and vanilla extract until well incorporated but do not over mix. 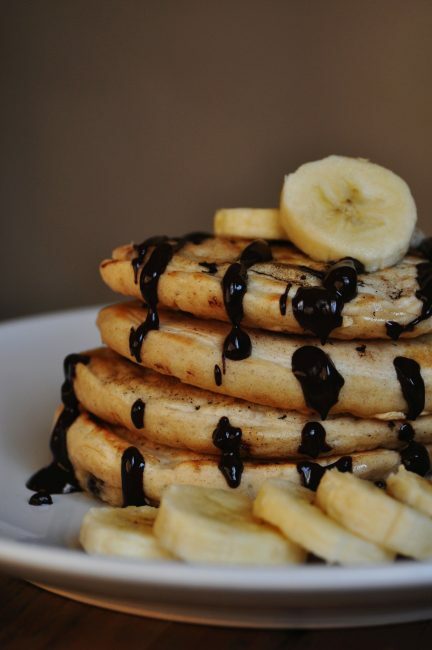 You can fold in one of the sliced bananas and chocolate chips at this time, or wait to add them to the pancake mix once they are cooking on the pan. Heat a large pan medium heat and lightly grease with the coconut oil or vegan butter. If you want to speed up the process, and depending on how many pancakes you can fit in one pan, you can use multiple pans at once. However, I wouldn’t recommend having more than two to avoid the chance of burning. Depending on how large or small you want your pancakes, scoop a few tablespoons of the batter on to the greased and hot pan to form your pancakes. 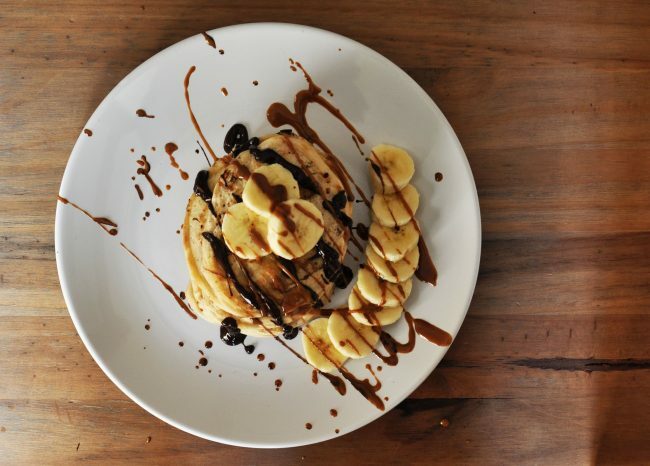 If you did not fold in the sliced banana and chocolate chips at the second step, you can lightly press them in to each individual pancake now. I usually do this when making pancakes for multiple people who want different ingredients. When the pancakes start to bubble on top and get slightly golden underneath, flip them over to the other side to continue cooking until they are cooked through and the bottom is also slightly golden. Repeat this process until all the batter is gone. I normally store the finished pancakes in a pot with a lid to keep them warm until they are ready to be served. 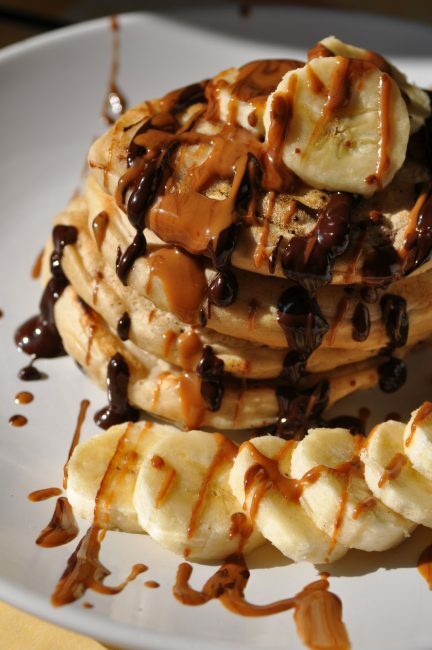 Once they are all ready, garnish with the other sliced banana, chocolate sauce, biscoff spread, or any other toppings of your choice.